Grand Opening Sale! Celebrate the Newly Expanded Longmont Location! 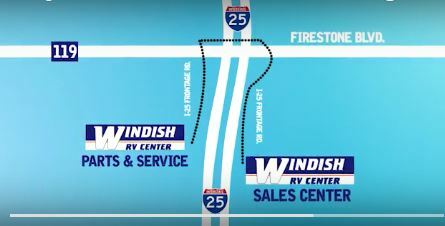 Attention: We have exciting news to share from Windish RV… we’ve expanded our Longmont location and are celebrating our New Sales Center with a Big Grand Opening Sale! 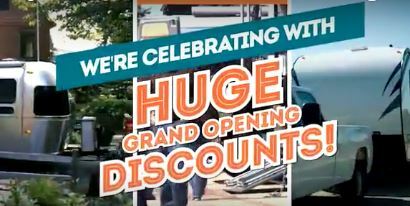 Fantastic products from manufacturers like Dutchmen RV, Forest River RV, and Grand Design are all available at Grand Opening Sale Prices Colorado’s #1 RV Dealer! This is the perfect opportunity to trade in your old RV for a new, state of the art Fifth Wheel, Travel Trailer or Toy Hauler. Our Grand Opening is a party… Let’s make a deal! Have questions about Financing or Insuring an RV? We can answer them! We want to make your RV Purchase as easy as possible by making our dealership a one stop resource for all your RV needs. You can even apply for RV Financing Online! 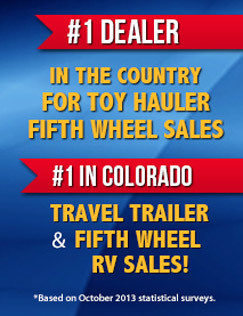 There’s a reason Windish RV is #1 in Colorado for Fifth Wheel and Travel Trailer Sales. It all comes down to superior customer service. We love happy campers! See what some of our customers have said about us in these Testimonials. By expanding our Longmont location, we hope to better serve our greatest asset, our loyal customer base. Come visit our Expanded Longmont Location and take a tour of our exciting New Sales Department. We have a large lot full of new and used RV inventory to show off. Contact Us at Windish RV for specials! Our friendly RV specialists are here to lead new campers on a tour of all our new and used RV inventory available at amazing Grand Opening Deals!